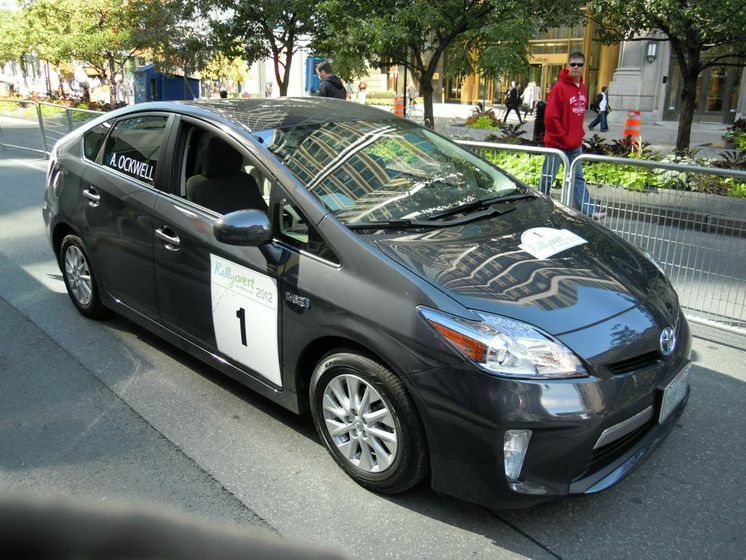 (TORONTO) – For the third straight year, the Toyota Prius Plug-In Hybrid (PHV) has led Toyota Canada to victory in the Rallye Vert de Montréal, a world championship of “green” rallies and the only Canadian stop on the global FIA Alternative Energies Cup circuit. The PHV, with its unique Hybrid Synergy Drive® platform, placed first in fuel consumption, with only 19L of fuel used for the 530 km of rallying, or average fuel efficiency of 3.6L/100 km. As an additional highlight for the Toyota family, the Lexus CT 200h recorded the second-best efficiency, at 4.3L/100 km. The results are notable, particularly as other companies have been comparing the performance of their vehicles to the Prius, and results like these demonstrate how it remains the benchmark for green vehicles. The PHV was also first in regularity (speed accuracy). A key element of winning the rally is a combination of the consumption and regularity rankings. By placing first in both categories the PHV was the rally’s decisive winner, and with the CT200h placing a strong second. The PHV is built on a proven hybrid powertrain – technology Toyota has been offering to the market for more than 10 years. As of the end of August, 15,636 of the vehicles have been sold globally. The Prius PHV is now available for retail sale in Canada. With the PHV winning the Montreal rally, Toyota Canada has earned a berth in the Rallye Monte Carlo des Energies Nouvelles, to be held next March. The Monaco event is the world’s oldest and most prestigious green rally. It will be the first rally on the 2013 FIA Alternative Energies Cup calendar. The PHV was driven by Vinh Pham, Toyota Canada’s Advanced Technology and Powertrain Engineer, who was assisted by navigator Alan Ockwell. Pham was also behind the wheel when Toyota Canada claimed the 2011 title. To learn more about the PHV and see photos of the Montreal rally, visit the Toyota Canada Prius Plug-in Facebook page: www.Facebook.com/ToyotaCanadaPriusPlugin.